When the bridge became part of the Interstate Highway System, its daily traffic skyrocketed to unsustainable numbers, sometimes reaching up to 18 times its original planned capacity. The old truss bridge was eventually demolished in 2017, after Phase I of its replacement – one of two cable-stayed bridges, the first of their kind in New York City – was completed ahead of schedule in April of that year. Phase II of this project involves the construction of a second cable-stayed bridge for westbound traffic. The first bridge, which currently serves both east- and westbound traffic, will become eastbound-only upon completion of the second bridge. 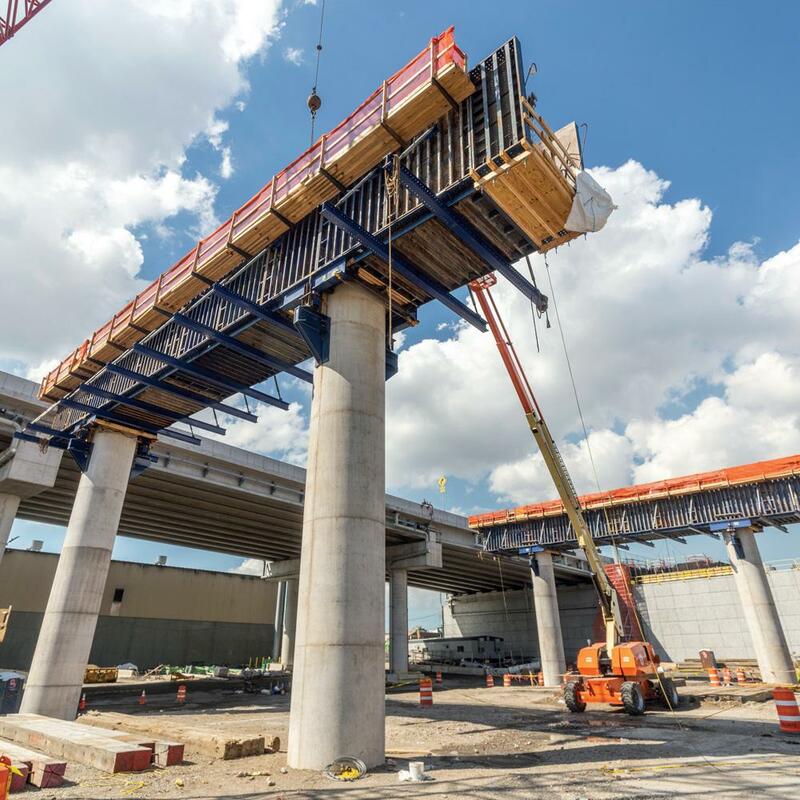 Doka was brought onto both phases of the Kosciuszko Bridge project due to past successes with the general contractor and our ability to provide material for all aspects and areas of the project. 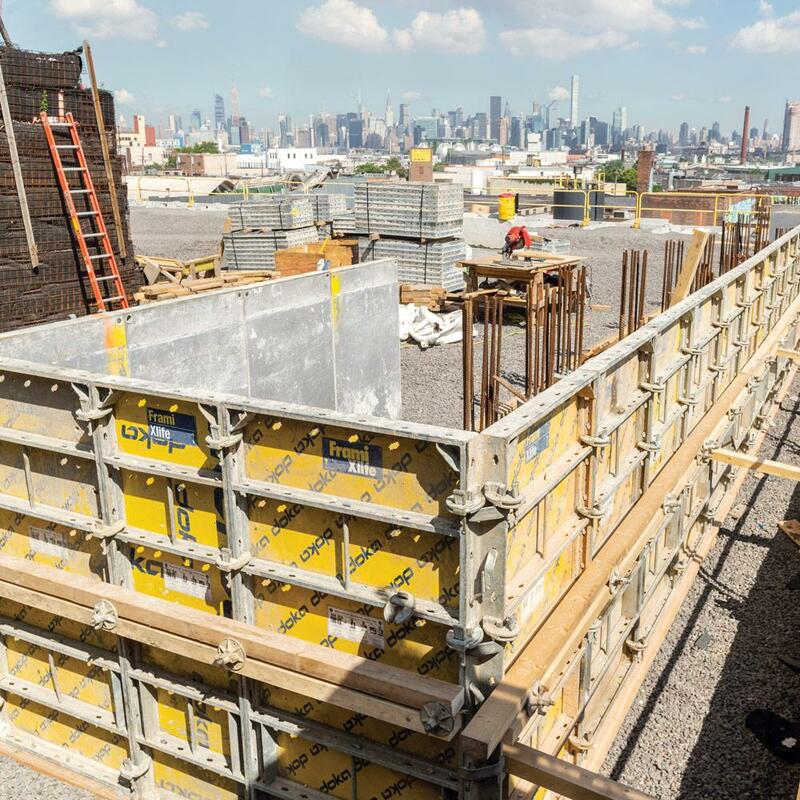 In Phase II, Doka has provided multiple solutions, including Frami, steel column forms, girder panels, Framax, Staxo and 100k/200k shoring towers. Crews used Doka’s 300k brackets/spreader beams, Staxo shoring, 100k shoring and 200k shoring to form various pier caps. Steel cover plates were then used on the top and bottom of the sides of the girder panels on the pier caps to reinforce their strength as they spanned from one column to the next. Together, the two bridges will improve traffic safety, reduce congestion and improve travel speeds thanks to the design of wider driving lanes and shoulder widths, auxiliary lanes in both directions, and a reduced incline that allows trucks to more easily maintain a consistent speed when crossing. These improvements are projected to reduce delays by more than 65 percent during peak hours. Phase II of this project faced several schedule increases and had a set completion date of the end of 2018. Additionally, it required the cycling of large material from one side of the river to the other as well as requiring formwork to span the typical pier cap distance of 50 ft. between columns. The use of 300k brackets/spreader beams in the columns allowed the formwork to span over the required distance, while the girder panel assembly could be cycled from one cap to another in two segments. Using consumable anchor material in the caps made stripping the formwork much easier and safer. The adaptability and use of so many different systems allowed the customer to meet any increases in schedule, such as utilizing Staxo shoring with Framax panels to form a pier cap as a quick alternative. Thank you for your interest - Kosciuszko Bridge Phase II. Thank you very much for your interest - Kosciuszko Bridge Phase II.